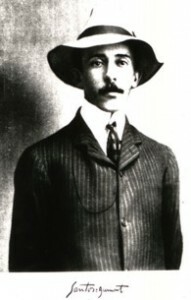 Alberto santos-Dumont, brasileiro, nasceu em 20 de julho de 1873 num lugar denominado Cabangu, no distrito de Joăo Aires no Estado de Minas Gerais. Realizou seus primeiros estudos no Colégio Culto à Ciência, em Campinas, São Paulo entre 1883/85. O primeiro vôo publico de Santos-Dumont com um aparelho mais pesado que o ar ocorreu em 23 de outubro de 1906, no Campo de Bagatelle, em Paris/França, com o avião de nome 14-Bis. O primeiro vôo de Santos-Dumont, na presença de milhares de pessoas no Campo de Bagatelle, foi amplamente fotografado e filmado. No Vôo do 14-bis todos os preparativos do vôo foram fotografados e a vitória alcançada por Santos-Dumont foi noticiada pelos mais importantes jornais do mundo. O Aeroclube da França registrou o acontecimento em ata especial. No ano de 1906 havia dois pręmios de aviação a disputar: um oferecido pelo Aeroclube da França, para um vôo de cem metros de distância amplamente divulgados pela imprensa mundial e outro, oferecido pelo Sr. Ernest Archdeacon, para quem conseguir decolar, voar mais de 25 metros e pousar com um aparelho mais pesado que o ar saindo do chão usando exclusivamente os recursos de bordo sem qualquer auxilio externo. 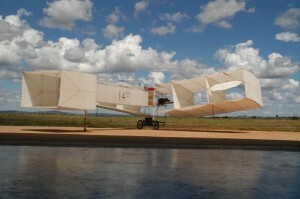 Santos-Dumont vôo muito mais, e ganhou os dois premios, fez isto frente a imprensa e as autoridades do aeroclube da França. Alberto Santos-Dumont, was born on July 20, 1873 in the state of Minas Gerais, Brazil. He did his first studies in the College “Culto a Ciência” in Campinas, São Paulo, between 1883/85. He moved to France in 1891 with his parents. 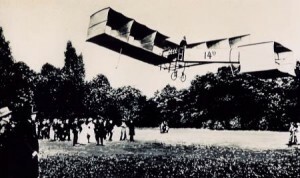 The first public flight of Santos-Dumont with a heavier-than-air airplane occurred on October 23, 1906, in the Bagatelle Field in Paris, France, with the plane named 14-Bis. He set the first aviation record in Europe, flying 220 meters in 21-1/2 seconds with members of the Aero-Club du France in attendance. Santos Dumont receive a prize for making the first flight in Europe over 100 meters, and because he was observed by officials from what would become the Federation Aéronautique Internationale, he was credited with making the first powered flight in Europe. The first flight of Santos-Dumont in the presence of thousands of people in the Bagatelle Field, was widely photographed and filmed. In the 14-bis flying all flight preparations were photographed and the victory achieved by Santos-Dumont was reported by the most important newspapers in the world. The Aero Club of France recorded the event in special minutes. 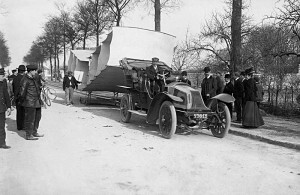 In the year 1906 there were two aviation prizes to play: one offered by the Aero Club of France for a flight hundred meters away widely reported in the world press and other, offered by Mr. Ernest Archdeacon, for anyone who can take off, fly over 25 meters and land with a heavier-than-air rising from the ground using the onboard resources exclusively without any outside help. Santos-Dumont flight much more, and won two awards, did it in front of the press and the flying club officials of France.